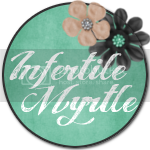 The Infertility Overachievers: "Santa!! I know him!!!" Now London can officially say this! Today London went and met Santa for the very first time. He did such a good job. I was expecting him to FREAK OUT, but he didn't he sat and stared at Santa. We got a really cute picture of him doing this but I can't upload it for a few more days (LONG STORY). 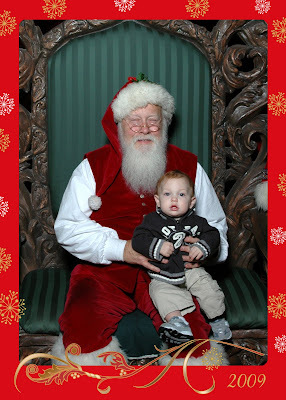 Here is the picture of London with Santa (Santa apparently squints all the time, no wonder he needs Rudolph's nose to guide his sleigh) as well as a few more Christmas pictures. Before I start getting nasty comments. They are heatless bulbs, and I made SURE not to let him put them in his mouth. Last year there were only 2 stockings hanging by the fireplace. I could not have asked for a better year! 3 stockings definitely makes for a great year! :) Thanks for your comment on my post. I appreciate it! 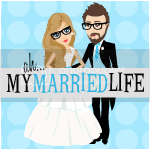 I am such a horrible blogger.